I am constantly asked the question – where are you from? No matter what the situation, my reply is always shameful – I’m from the United States. Because of this shame I decided to leave my home of eighteen years and move halfway across the world to Australia, all by myself. Lots of people tell me that this was a bold and courageous move, but for me, it seemed to be the only option that I had at the time. I was desperate, sad, and most of all, ashamed to be a part of America. Although it’s been eight years since I departed ways with the USA and I’ve now become an Aussie citizen, that American part of me still lingers. It shows up first in my voice (although my family thinks I sound British and can’t understand a word I say now, everyone here in Oz immediately recognises me as from somewhere else). Of course it also shows up in my records – I’m still an American citizen, the only reason for this is that it makes it easy to visit my family when I can (who really wants to fill out all those bloody visitor forms after a fourteen-hour plane ride?) In these ways and in many others, such as the food that I crave and the way I act, talk, and even dress, I am still an American through and through. I cannot run, I cannot hide: this part of me still shines through. Why? Well, because being an American is not something anyone should really be proud of. Honestly, look at what we’ve done to the world recently – war and climate change to name a few. However, as it seems that more and more first world countries are contributing to the world in these disastrous ways, I’d like to point out a few more unique reasons as to why being an American is shameful. We’re unhealthy, annoying, fake, competitive, and most profanely, we are seriously ignorant. And these are not just my observations. In an incredibly comprehensive and honest take on the image of America, René Zografos has compiled the book Attractive Unattractive Americans: how the world sees America. This book has seen Zografos travel the world in search of the brutal truth of how the USA is seen by the rest of world, and damn, it’s refreshing to read. 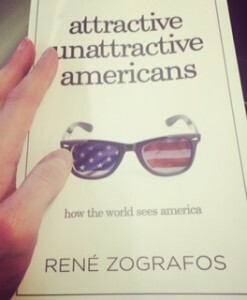 Attractive Unattractive Americans is described as “7 years + 7 continents + 1 journalist = surprising perspectives on the ‘greatest country on Earth’” and indeed it does deliver. We hear from thousands of people, from ordinary people to experts in their field, and the result is a fascinating real-life take on what presence and influence the USA has on the world. For whatever reason, America is sometimes considered the hub of the modern world with its tall buildings, movie stars, and fast food. It seems that everyone has definitely at least heard of America, and now we know that everyone also has an opinion on the country as well. The book goes from hilarious to downright smart interpretations of America. I found myself laughing and crying, sometimes at the same time, but most importantly, I was relieved to find that most of the world has a similar view on America that I do, and I discovered that I was not alone in my shame, or my confusion, or my running. In all these years I have been pinned with negative opinions about who I am because I am originally from America, and as much as I’ve tried to step outside of that, the problem still remains, my blood runs red, white, and blue. It wasn’t surprising to find that there were some positive outlooks on America as well – after all the marketing spin that’s put onto the USA is that it’s the land of the free and if you have a dream, you can fulfil it there. However, any time that I read a positive take on America I immediately thought back to a previous chapter or paragraph in which someone spoke about how this flimsy surface of America appeals to a lot of people, but as soon as the surface is broken, what lies underneath is a web of ignorance and fakeness. Sure, it’s great that Americans think positively about their dreams and think that they are the freest country in the world, but the reality is not the case. Americans work the hardest but are sometimes paid the least, they are unhealthy, and they hate each other and the rest of the world, and are often proud of the fact that they have these strong opinions. America is like a big giant stepping on everyone below – yes, the giant is huge and magnificent, but it doesn’t care that every step it takes wipes out an entire flock of people who also have important lives and opinions. This book is definitely one that all Americans should read. Although it is aimed for anyone and everyone to pick up (no matter who you are you will learn a thing or two) I can only really say that this is a book that those ignorant Americans must be forced to read. Of course, this is in a perfect world, where we could actually get this book to every American that needs to read it and they would actually want to read it. Alas, because of the initial ignorance that most Americans have, it would be very difficult to get them to pick this book up, let alone read through more than a few pages. It’s a shame, because Attractive Unattractive Americans is saying the kinds of things that made me leave my home country and experience a world outside that “perfect” little bubble. I’ve learned so much more about who I am because I’ve opened up to people who are not from American soil. If even a small percentage of Americans were to have this realisation, either through reading this book or through travelling and learning first hand what the rest of the world really thinks about the home of the brave, then surely we’d have a different story on our hands altogether. Originally posted on That Reminds Me mag. This entry was posted in Arts, Books, Opinion. Bookmark the permalink.